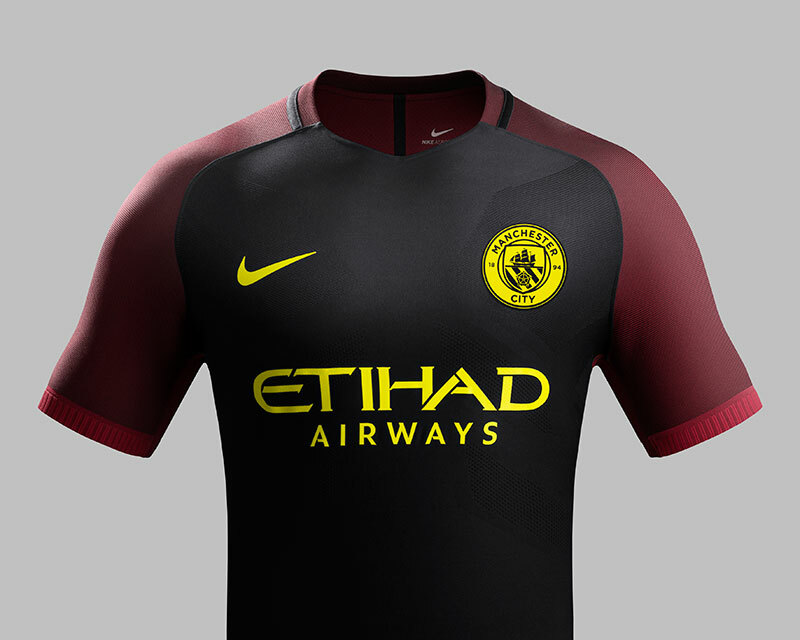 Manchester City and Nike have had some great kits down the years, this is perhaps one of the most bold so far. Will this kit help guide City and Pep to the Premier League title? 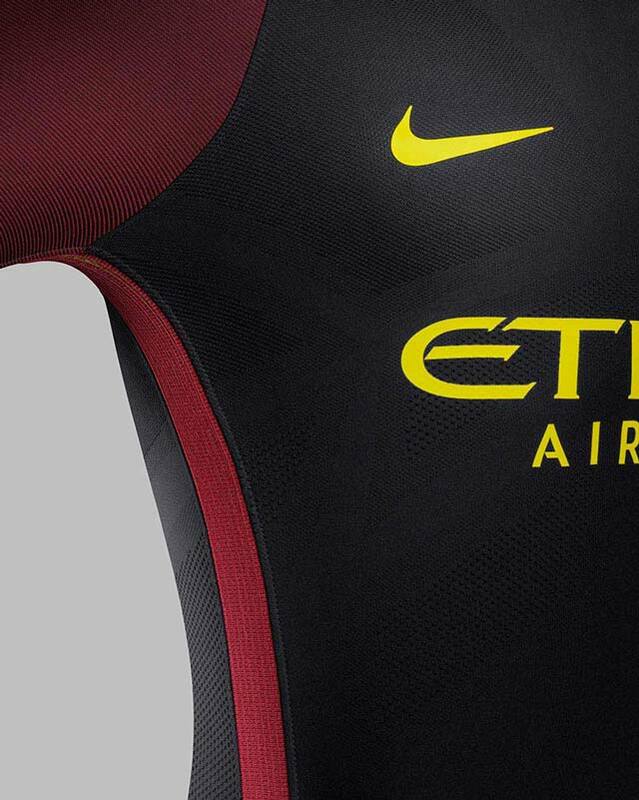 Manchester City and Nike have unveiled the rather bold away kit for the 2016-17 season. The kit is predominantly black with red detailing and flashes of yellow. The look is inspired by famous black and red kits of Manchester City’s past and a Manchester icon: the worker bee. The insect has been synonymous with Manchester since the early nineteenth century when it was first used to symbolise the city’s rapid growth during the Industrial Revolution. Since 1842 Manchester’s coat of arms has featured seven worker bees, and the insect can also be seen throughout the city on buildings, bridges, bollards, and a floor mosaic in the Town Hall. Subtle and understated, wildcard for best kit? As a nod to the colour of the bee’s eye-catching stripes, the new away kit’s distinctive black body and red shoulder and sleeves are embellished with vibrant yellow detailing. Yellow runs throughout the kit, notably in the club crest on the shirt and shorts, the Nike Swoosh and the Etihad Airways logo. The club’s crest, new for 2016-17 and first featured on the recently revealed home kit, is re-imagined on the away kit in yellow and black – with the colour scheme evoking the worker bee, while the badge immortalises other iconic Mancunian symbols including the Red Rose of Lancashire and Manchester’s trading ship. Nike really do know how to do the details well. Two tributes to the club are also knitted into the design: the word “City” at the back of the collar, and, on the inside of the cuffs, “Est. 1894” feature as another reminder of the club’s storied history and reference to the new badge. The advanced performance technology in the kit is visible on the chest, where engineered knit zones create a geometric pattern that enhances fit with smaller mesh shapes at the bottom of the graphic. Whilst the body of the kit is realised in black and yellow, the sleeves and shoulders are made up of a ribbed fabric featuring subtle stripes in black and red. As the player moves, this ribbing adapts to subtly shift in colour. “The look and fit of our new away kit is great. You really notice how it feels lighter - I’m really looking forward to putting it to the test this season,” says Kevin De Bruyne. Shades of red have been a feature of Manchester City away kits throughout the modern age, most memorably in the iconic red and black striped away kit of the 1960s, worn in the Club’s 1969 FA Cup Final victory and more recently in 2011-12, another historic title-winning season. It was going so well until the yellow socks. From the front both red and black are visible, emphasising the power of the shoulders’ outline, but from the sides only the black is visible. The sides of the kit feature a red stripe that runs the length of the shirt and shorts. Expanding when the player is in motion, the stripe maximises ventilation and reveals a subtle underlying yellow. Yellow socks, with a black linear graphic on the calf, showcase the kit’s primary accent colour and accentuate speed. What do you think of the new Manchester City away shirt? Good job by Nike? Let us know in the comments and make sure you follow us on Facebook, Twitter, Instagram and YouTube!